I love hats. I really do, it borderlines addiction, and you’d probably agree if you ever see my closet! You’ll often see me wearing my outdoorsman hat (I mean that both literally and metaphorically), my Twins baseball hat (also literally and metaphorically), and a music lover hat (I only mean that metaphorically, I should get a music lover hat though). However, the most important hats I wear are in my roles as husband, father, and servant of Jesus Christ! My wonderful wife Lara and I have been so abundantly blessed over the last couple years of our lives as we have been, through God’s grace, figuring out how to be parents to a passionate, joyful, and beautiful little boy name Sylvan. My wife and I both hail from South Dakota, meeting in high school, and eventually going to college together at the University of South Dakota in Vermillion SD. 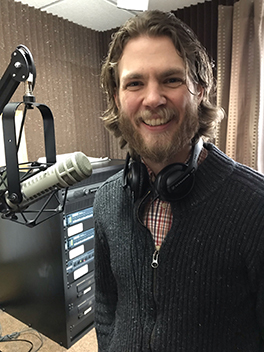 There I studied Theatre with a specialization in Acting, and through my acting training, God led me into working secular radio in Sioux Falls SD. One fateful day, a good friend told me of an opening at a radio station called Kinship Christian Radio. Little did I know at the time, but that was God beginning to open a door of ministry work, I believe, for which He had been creating for me for a very long time. Thank you so much for joining me weekday mornings from 5:30-9:00AM, as we laugh, cry, praise God, play music, and listen to what God is seeking to tell us today.